STANDARD SHEET COUNT: 150 sheets per pad. CUSTOM DIE CUT BEVELED SHAPES: Custom shapes are available for a $350(Z) die charge. Please add an additional 10-working-days to the standard lead time for custom die cut beveled notepads. 500 piece minimum. 5-working-days! 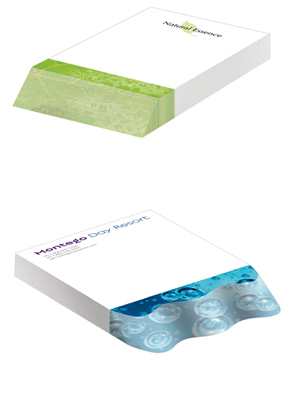 (*Add 3 additional working days for beveled notepad quantities of 1,000 pieces or more. For orders of 2,500 pieces or more, the factory will assign a ship date). 2-day service at ground rates. BIC Air Express 1 Day Air. Since BIC Sticky Note products are heavy, please Click here for complete shipping information. When ordering between quantity breaks, orders must be placed in 250-piece increments. Due to the die-cutting process, final pad will measure approximately 4" x 5 1/2".